The record is made up of 22 folios. It was created in 7 Sep 1854. It was written in English. The original is part of the British Library: India Office The department of the British Government to which the Government of India reported between 1858 and 1947. The successor to the Court of Directors. Records and Private Papers. to be smuggled into the Palhunpore district, where, being cheaper, it found a ready sale. the Palee opium will ,be nearly as cheap as the inferior drug produced in those districts." that 1.500 chests are annually taken into the Guicowar territory, and from thence exported. 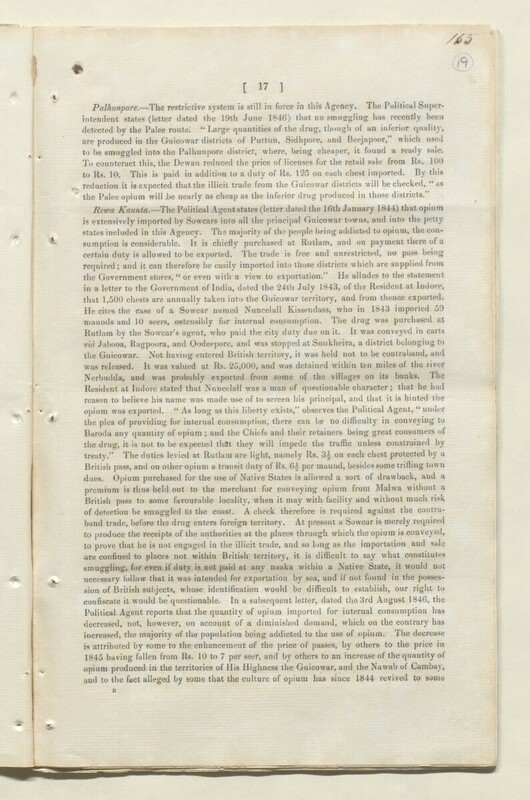 Circular N. 4142 of the Territorial Department Revenue from the Officiating Secretary to the Government at Bombay Castle, Charles Edward Fraser Tytler, to the Resident in the Persian Gulf Historically used by the British to refer to the sea area between the Arabian Peninsula and Iran. Often referred to as The Gulf or the Arabian Gulf. , requesting a report to the Government of any traffic in opium in the Gulf. Printed minutes from July 1846, July and September 1848, by Mr Willoughby and Mr Reid, regarding taking measures and reporting to the Government on Malwa opium traffic.